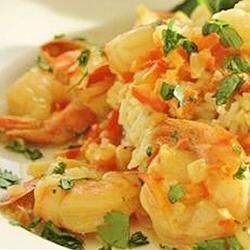 "Jumbo shrimp in a lightly spiced coconut curry sauce. Serve over hot cooked brown rice." Heat oil in large, nonstick saucepan over medium heat. Saute onion, red pepper, and garlic until vegetables begin to soften, about 3 minutes. Season with cumin, coriander, and curry powder. Cook for 1 more minute. Stir in coconut milk, sugar, and crushed red pepper flakes. Bring to a boil. Reduce heat, and simmer, uncovered for 2 minutes. Stir in shrimp, and increase heat to medium-high. Cook and stir until shrimp is cooked through, about 4 minutes. In a small bowl, combine cornstarch with 1 tablespoon water. Stir into shrimp mixture, and cook until sauce has thickened, about 1 minute. Stir in cilantro, and remove from heat.